Tin of Cards Class Announced! Act Quickly! Come for a fun afternoon of crafting and make this adorable set of 16 cards with gift tin for $40. Give as a gift or keep for yourself. 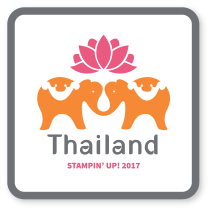 A 25% discount will be offered on the coordinating stamp set and additional card kits if ordered at the time of registration! This class will be limited to 8 so please RSVP early to save your spot! Deadline for registration/ payment June 10th. So excited to say that this is the last set of Weekly Deals before the launch of the new catty! 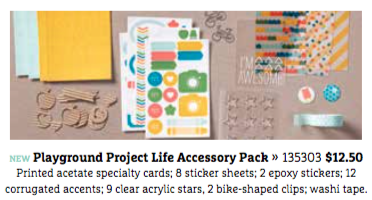 Colleen Thomas, you're the winner of last week's draw for the Playground Project Life Accessory Pack! I've got it here for you for pick up:) Make sure to use hostess code B3AQR26A when placing your orders this week to be entered! This week's winner will win a package of the new Cherry on Top Designer Series Paper 6x6 Paper Stack! To be honest, when I was preparing this quick and easy scrapbook page, I wasn't paying attention to much but the photo. I did realize that the new In Colours were a perfect match though! 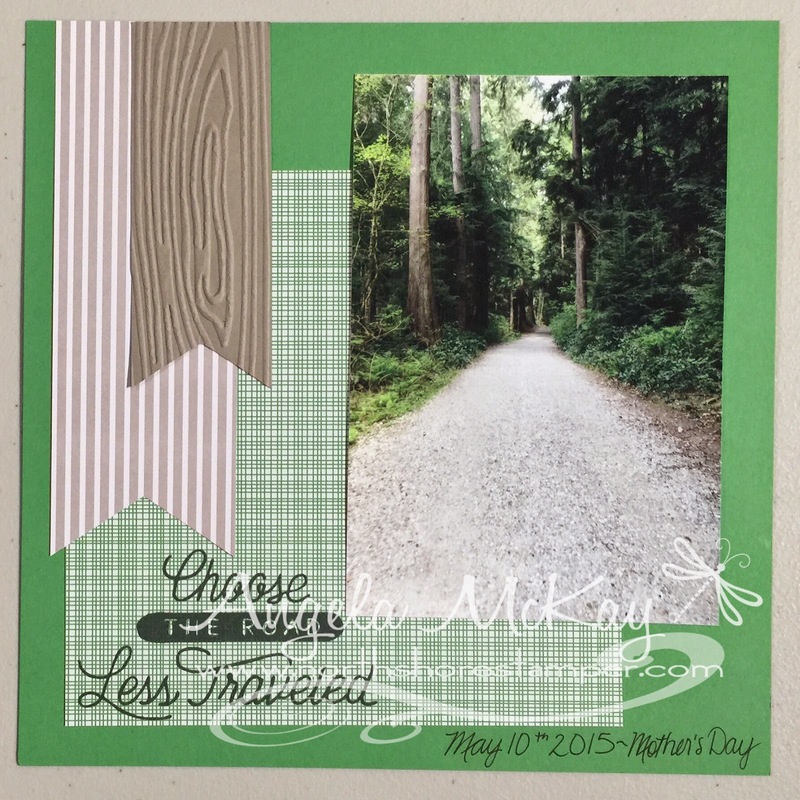 I've used the Cucumber Crush and Tip Top Taupe as well as the new Banner Triple Punch on this page. 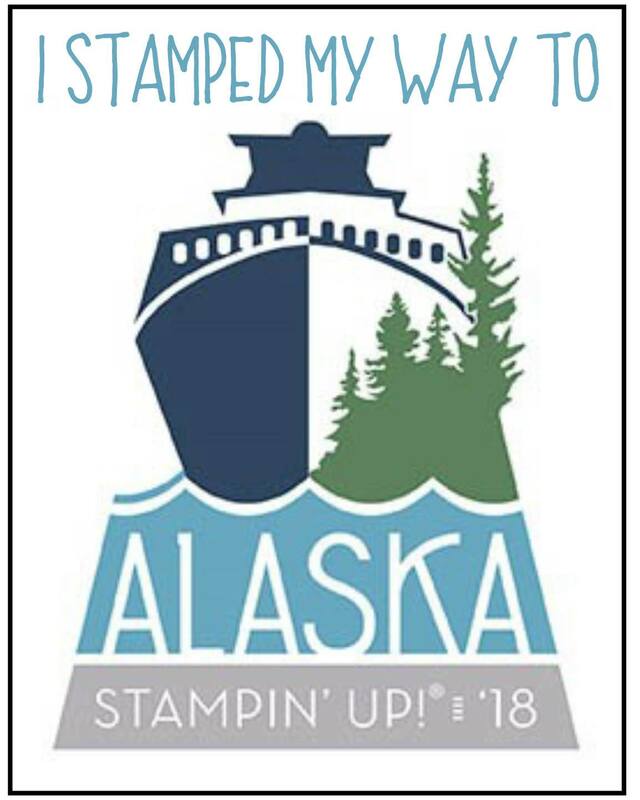 If you missed the stamp set, this is one you want to take advantage of quickly... especially for scrappers out there. I've shown it below:) I'll be taking 25% off this stamp set from today until May 28th at 10pm:) Make sure to email me your orders ASAP! This DSP is the Cherry on Top... literally! There's that adorable You're Sweet stamp set that coordinates with the Thinlits Treat Bag again! Just a simple sentiment but it cuts so cleanly and looks adorable with the little banner from the Banner Triple Punch! What do you think of the new Cherry On Top Designer Series Paper? Pretty cute eh? If you missed my video on the Banner Triple Punch you can check it out here! $5662 away as of this week! 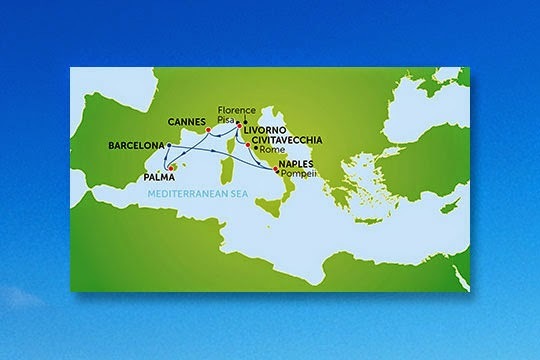 I've got 37 days left to do it! More Reasons to Join a Club or Host a Party! 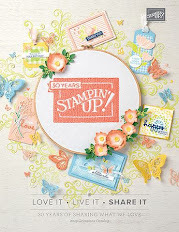 These two STUNNING stamp sets are going to be a MUST HAVE on your list, but in order to get hold of them, you're going to need to join one of my monthly clubs or host a workshop! 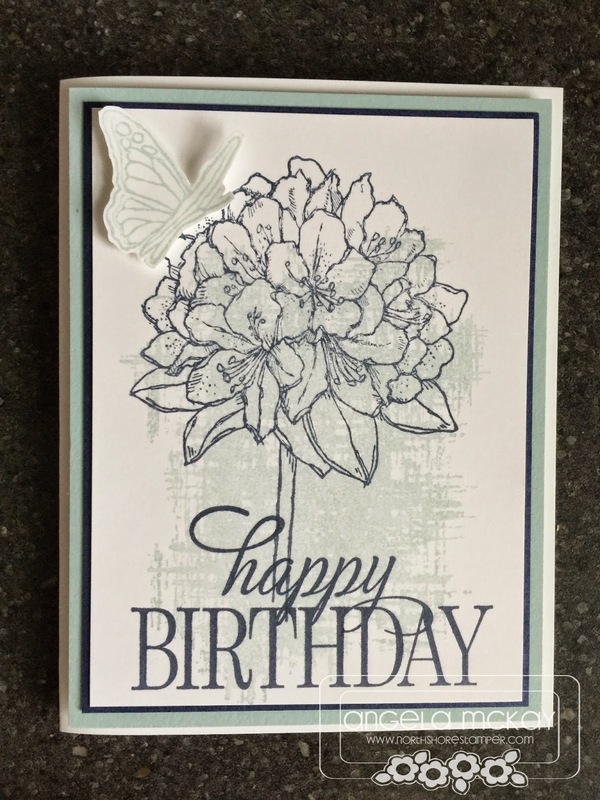 Happy Birthday Everyone and Best Thoughts are just two of the gorgeous new hostess stamp sets featured in the upcoming catty! 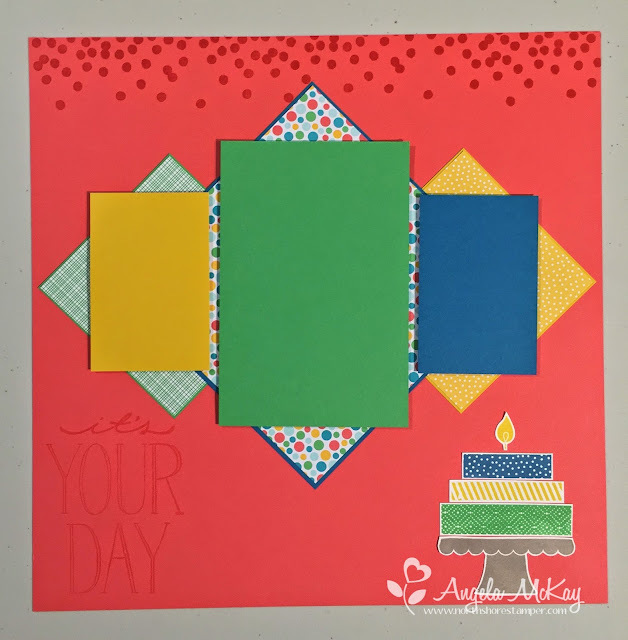 That Happy Birthday sentiment alone is enough reason to host a party or join a club... you should see the adorable little extras that are part of this set! You're going to love the new You're Sweet stamp set that was made to coordinate with the Thinlits Treat Bag! It is adorable and simply stunning to use on its own on a card as well!! 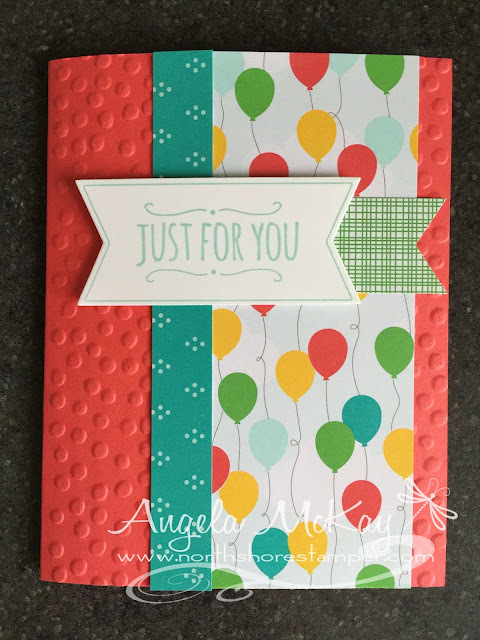 Cherry On Top Designer Series Paper Stack Sneak Peek! How adorable is this new stamp set Friendly Wishes???? The Cherry on Top DSP is GORGEOUS!!!! 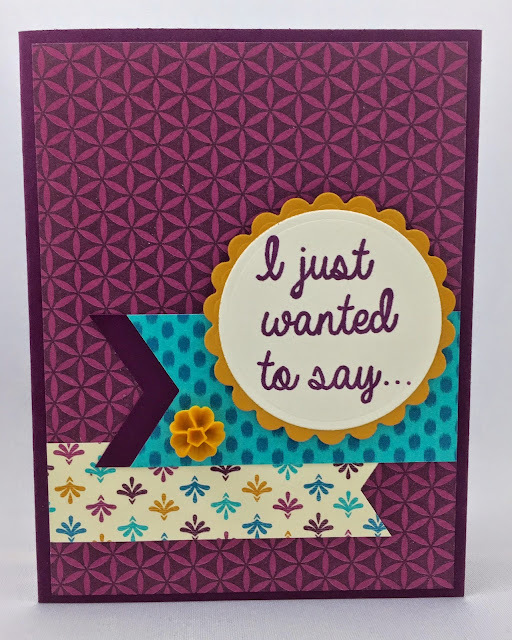 The colours are bright and vibrant and yet there is the perfect balance of neutral colours in the stack to create some elegant cards as well:) This was was just on the happy theme:) Check on the new Watermelon Wonder and Cucumber Crush In Colours!!! STUNNING!!! Unfortunately for me all these new colour names make me HUNGRY!!!! Weekly Deals, a Winner and a New Giveaway! 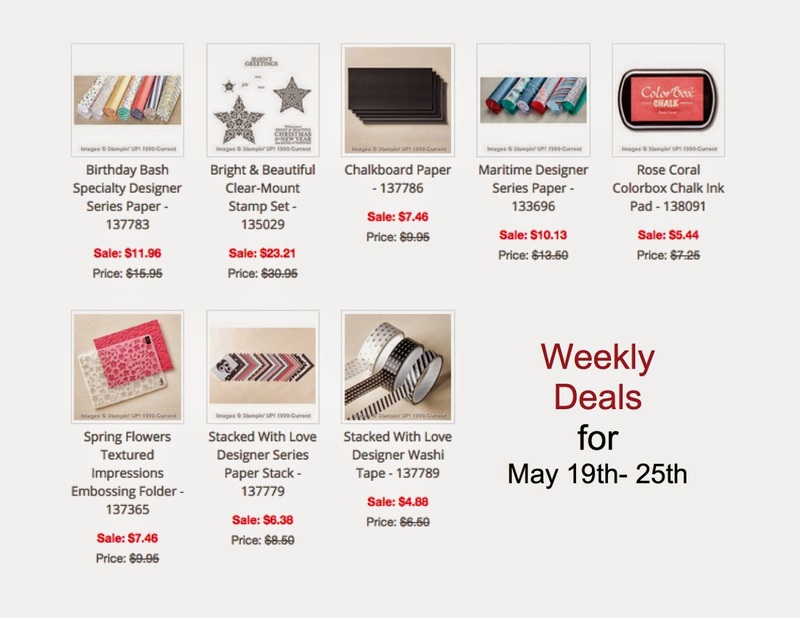 I'm so excited to share the weekly deals for May 19th-25th! I'd also love to announce the winner for last week! 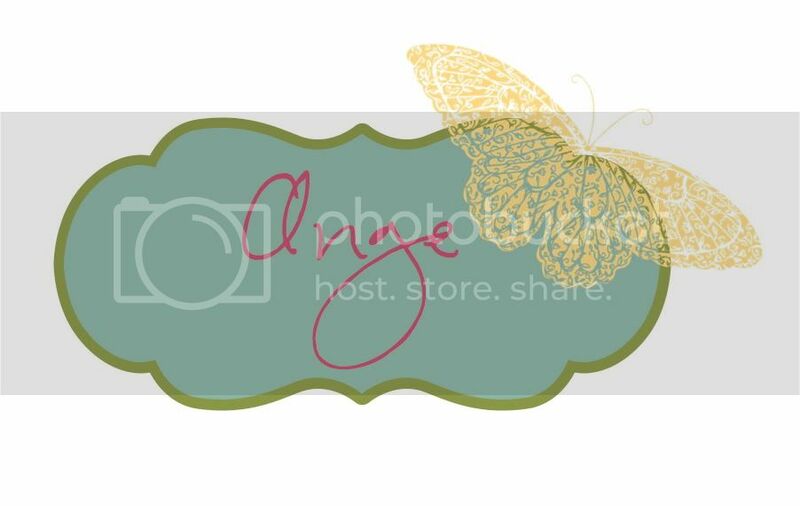 Shelby Yaky, you've won the Large Polka Dots Textured Impressions Embossing Folder for the Big Shot/ Texture Boutique! I'll get in the mail to you ASAP! This week's giveaway is for the Playground Project Life Accessory Pack! All orders of $50+ will be entered in to win this fun giveaway! If you're not already hooked on Project Life, it's time to be!!! I'll announce a winner next Tuesday May 26th! In addition, just to make it easier to get entered, I'd love to offer you 25% off of all Project Life products until next Monday May 25th! This includes those wonderful items already on the Retirement List so don't miss out! 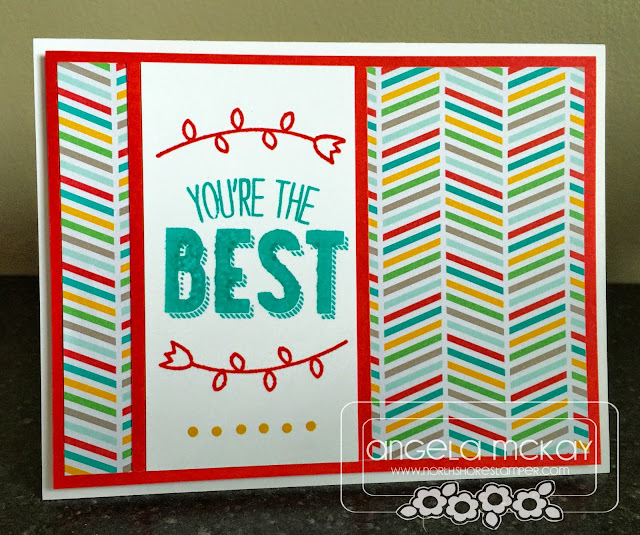 I'm so excited to share this week's Hand Stamped Sentiments Sketch challenge with you! 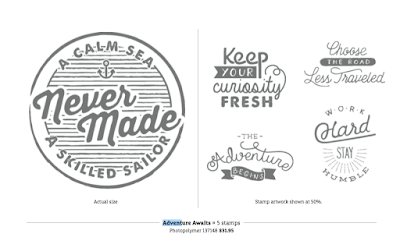 I am a HUGE fan of sketch challenges as they take away a tough part of the creative process for me. When it was time to create this card I was away at my cabin with limited stamps, but I had a ziploc bag with me full of all my previous Paper Pumpkin stamp sets. It was perfect! 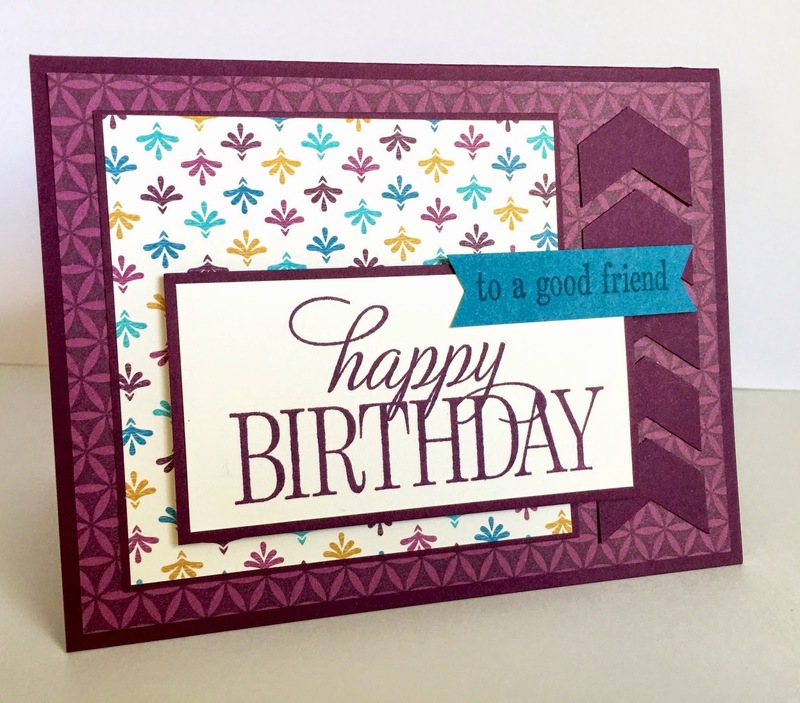 Paired with the Bohemian Designer Series Paper that will be released with the new catty on June 2nd as well as the FABULOUS Triple Banner Punch that I shared the video on yesterday, it was an easy card! Make sure to head over to Hand Stamped Sentiments and check out the creations of the other design team members and then come and play with us! Triple Banner Punch... more uses! 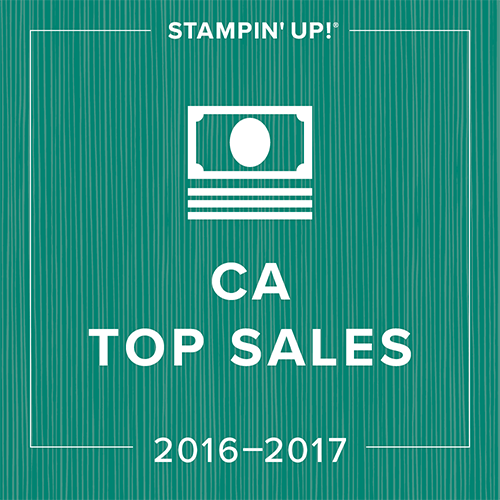 Check out the exciting new products featured in today's card! Best part is, although they're not available to the general public until June 2nd, you can get hold of them early by becoming part of my West Coast Creators team:) Contact me for more info! Designer Series Paper Stack Sneak Peek! Check out some of the gorgeous patterns from the upcoming Designer Series Paper Stack in the catty launching June 2nd!!! This is the smoky slate... it almost has a sheen to it! I can't believe how gorgeous it is. I wasn't planning on ordering these in each of the colour families, but after having received the Neutrals version, I'll be getting them all! Happy May long weekend everyone!!! I'll be offering 25% off of all Big Shot products for the WHOLE weekend!!!! Want your Big Shot??? Now's the time to get it at 25% off!!! 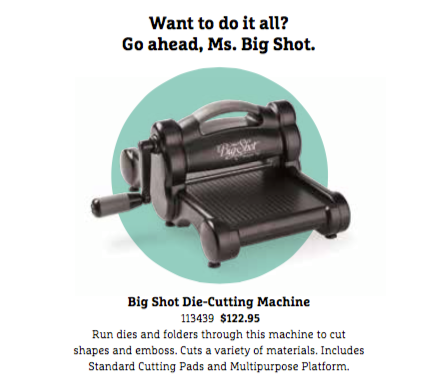 Machine, embossing folders, dies, and framelits all included! Email me your orders to take advantage! 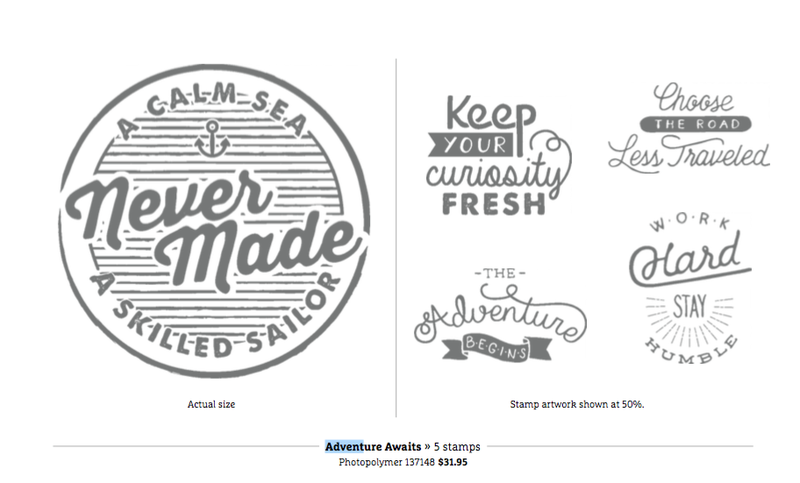 All orders over $100 will also include a free embossing folder from me! If you haven't tried My Paper Pumpkin, now is a great time to sign up! 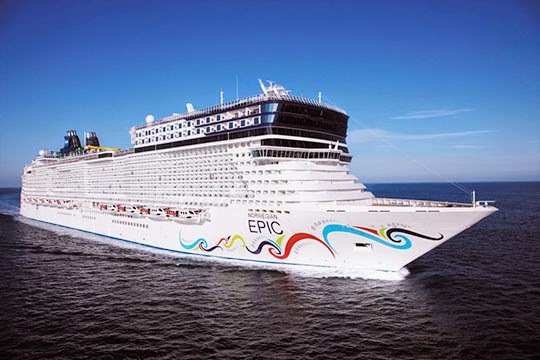 With a deal like this you'll want to invite everyone you know to give it a try too! Offer Details: Use the code SAVE50 to join Paper Pumpkin before June 10, 2015 and get 50% off of the first two months! After that, keep the creativity coming for just $24.95 + tax per month (shipping included). Anyone signing up during this promotion will be entered to win a free extra month of My Paper Pumpkin on me... winner will be announced on June 11th! If you missed out on the $7 My Paper Pumpkin deal the other evening, don't do it again! Although it's not the same deal, it's pretty fabulous in itself in that you'll get My Paper Pumpkin for two months at 50% off! Click on the photo below to be taken directly to my site and make sure to drop me a line after signing up just to confirm it was received:) You'll also receive an invitation to join my private Facebook group for my Paper Pumpkin subscribers where you'll have opportunities to win prizes, view other fabulous creations that you can make with your kit and hear about upcoming promotions! This week's inspiration photo spoke to me in a funny way. I never really saw what was in the picture...simply the colours! I decided just to roll with that and create my card based around this rich combo! 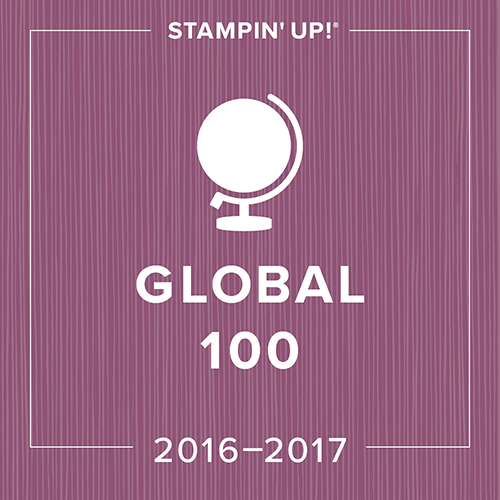 When you look at my supply list you'll notice that there's no stamp set listed, that's because it's a sneak peek of the new catalogue! It goes perfectly with the Mini Treat Bag Thinlits! 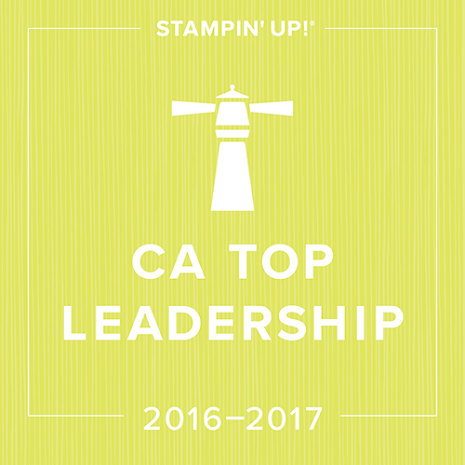 If you have these already then this stamp set will be on the top of your list! 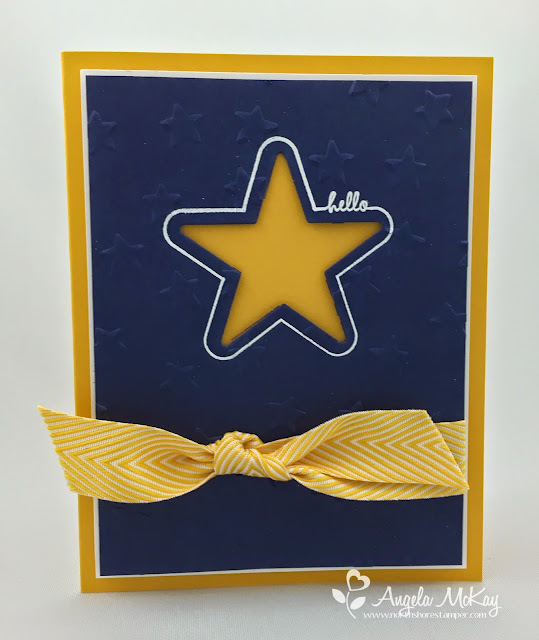 Don't you love how the stamp is made to go around the gorgeous little star framelit that is part of the set??? 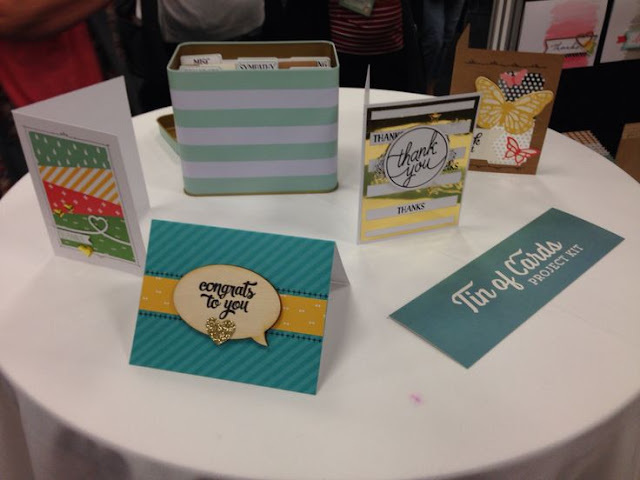 We'd love for you to come and join us this week at Stampin' Royalty! Come and share your magic with us! 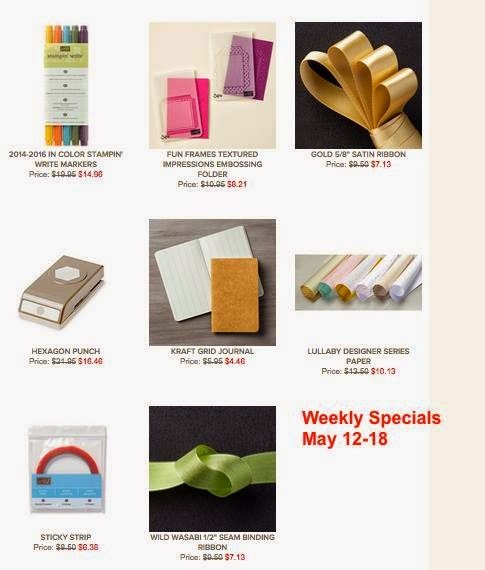 Weekly Deals May 12-18th are here:) Use hostess code X9QDZJ3W to be entered into a draw for Large Polka Dots Textured Impressions Embossing Folder. 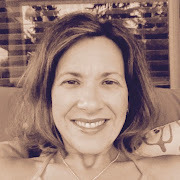 Last week's winner was Rosanne Tedesco! She has won a package of something Borrowed DSP! My Paper Pumpkin 24 Hour Promo Announced! 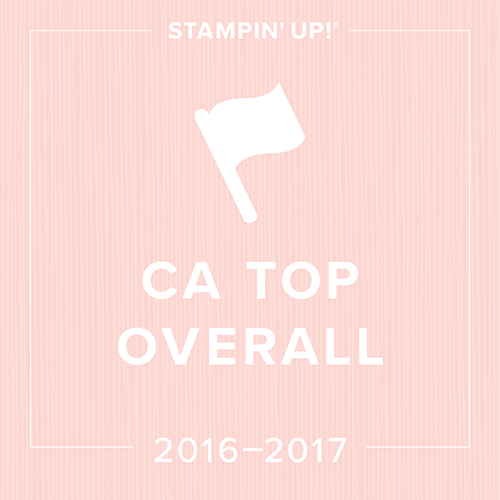 Stampin' Royalty Challenge #276 ~ Go Grads!